A couple of weekends ago, my friend asked me to give him a ride to the Italian store Ravioli on Commercial Drive to pick up two cases of lupini beans that he specially ordered. The beans are native to Italy and the ones that he received were from Portugal. I had never heard of these beans before and I am not surprised as my friend had to wait months for his order to come in. He was kind to give me a couple of cans in exchange for being his sherpa. I decided to make a masala curry which turned out fabulously. The lupini beans are quite crisp and crunchy like chestnuts and surprisingly took a long time to chew. My friend mentioned that they are high in protein and fibre and I quickly learnt that when I got full from eating only half the portion size that I normally do. This curry can be made in advance as the flavours saturate overnight. 1. Add 1 tbsp of olive oil to a large saucepan on medium heat. Add the cumin and mustard seeds and cook until they pop. 2. Add the garlic and ginger and saute for a few seconds until golden. Add the onions and cook until golden. 3. Add the potatoes and sauté for a few minutes. Add 1 tablespoon of olive oil and saute until potatoes brown. 4. Add the beans, spices and salt. Stir and cook for a few minutes. 5. Add the tomatoes, stir and cook for a few minutes. Fab dish darling!! This is a keeper…. 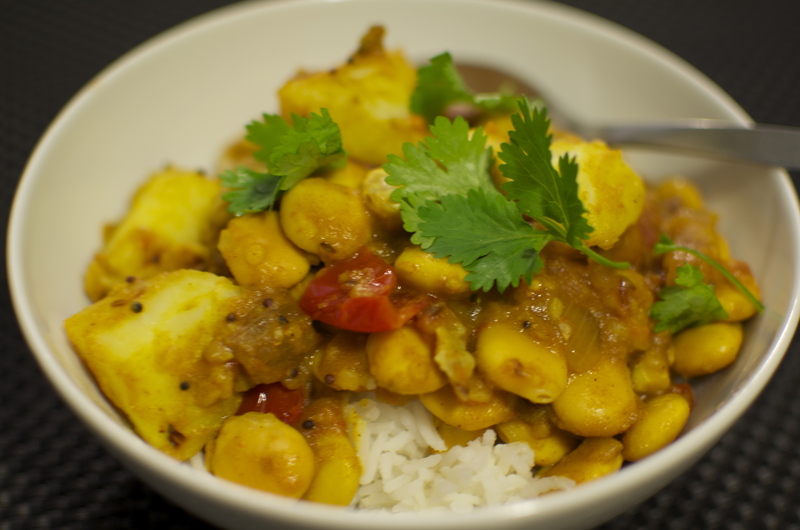 You are currently reading Masala Lupini Bean Curry at Coriander Kitchen.